As enthused as I was with the ease with which Michael Ignatieff had fielded and answered all my questions, I still had one more item on my agenda. I had gone there not just to meet him but also to hear him speak. I wanted to be there in the crowd, as he spoke, in order to get a sense of his style, his outlook and his vision, and i wanted to try to get a sense of the spirit of the man. I did not have to wait long. I could see Paul Zed moving towards the P.A. system on the steps of the old barn and I moved to the back of the crowd so I could take it all in, and see also how the audience was going to react to it. Paul picked up the mic, and thanked us all for coming, and casually mentioned that there was still food on the grill, and that he was very happy to have all of us there and that he was very happy to have Michael there as well. He said that it was Michael's sixth trip to Saint John in the last few years and that he had often stayed right there at Paul's house. 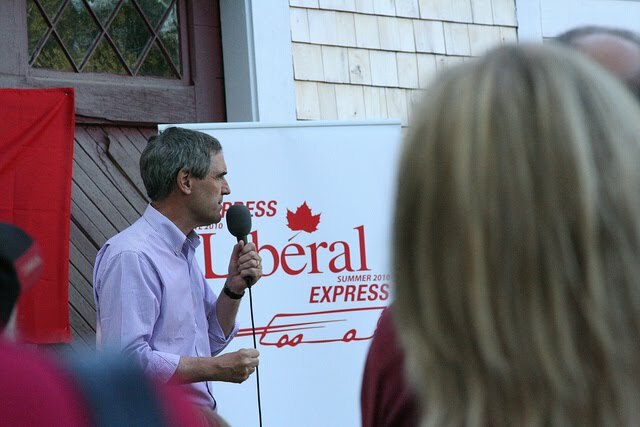 He introduced him as Our next Prime Minister and the crowd applauded loudly and enthusiastically as Michael Ignatieff stepped up casually, smiled as he thanked Paul, and took the mic. <>Note<>: I will not be "quoting" the Speech, as I did not tape it, But here are my impressions of it and since I've already let the cat out of the bag, it the main reason I found this trip so refreshing! This is New Brunswick of course, and it is also Nouveau Brunswick, so he opened with a bit of history on it's roots, and remarked on it's various peoples which he said included; La Brayonne, Les Acadiens, United Empire Loyalists, First Nations ( Mi'kmaq and Maliseet ), Early European settlers and more recent immigrants from all over the World. He said that New Brunswick was as proudly multi-cultural a place as there is in Canada, and that he was proud to have roots here. ﻿ I did not realise that he had roots here, so I listened intently as he told us that they had just come from Kings Landing, an Historical Settlement along the Saint John River which is a recreation of a New Brunswick town from the period of 1780-1910 and that he was surprised to realise that, one of the oldest buildings there was called "Fisher House" and was built by an ancestor of his named, not surprisingly, Fisher. That was cool enough in itself, I thought, but he then said that his Grandmother, Maude Parkin Grant, who was, I assume, on his mother's side, was also a New Brunswicker and that she was buried in Salisbury NB. ! ! ! I am certain that he did not know it was me who shouted, but I think he heard it, because he decided to elaborate. I guess he was in no hurry. And as it turns out, he was not. He said that he, along his wife Zuzanna, and his friend (our host) Paul Zed had made a very special trip to Salisbury, NB, just last summer, to find her resting place and hopefully her headstone. They managed to find it, with a little help, cleaned it up a bit and spent some time there reflecting on what it means to have roots here. He said that he had always been very much at home here, but was even more-so since, the trip to Salisbury. It was not hard to believe as he seemed to be having fun and was in fine form. He used no script, no teleprompter, no cue cards and he showed no signs of needing them. That alone was Refreshing. He was in fact, as it turned out, just warming up. <>Note<>: I found out later that evening from another guest that they had managed to find it in a farmer's back field that in the corner of which was hidden the few grave markers there and that it was now somewhat grown up and is lightly wooded. The guest also said that Paul would be able to give me more information on it, including the farmer's name. I am only 15 minutes from Salisbury, and I know my way around, as I grew up there, so I thought I might love to go and try to find it myself and brush it off, and spend a little time contemplating my own roots. That sounded like a worthwhile thing to do! And this time, I promised myself, I will not forget my camera! He then smiled broadly and said that he was here to do better, that we deserved and needed better, and that we need a Government that is based on Compassion and Respect. That we need a government that values education, values science and reason, values the environment, and that values and respects people. He said that he was not really a partisan, and that he valued co-operation and that a good government worked with the opposition parties and sought out information from many sources to insure that things progress. Progress, he noted was a word that was used no longer by the Conservatives. And that we can all see that cooperation was not Harper's style. He said it would be his style. He briefly touched on; Harper's treatment of the Press, his lack of cooperation on any level, the one source contract for $16,000,000,000.oo for the stealth F35s, the Cost and the overall handling of the G8/20, right down to the fact that it was stupid to ever have had it in Toronto, and the Fake Lake. He mentioned the incredible amount being spent to show how well Canada Inaction Plan is being managed, the Omar Khadr issue, his total lack of action on the environment, the Prorogations, one being the result of his dragging his feet (he left out his dragging knuckles though) on the detainee issue, his gutting of Human Rights Commissions, his ideological redistribution of funding from humanitarian to the more right wing NGOs, the recent announcement about changes to the census, in spite of Canada's almost unanimous disapproval and his stubborn insistence that it will go ahead. There were a host of other issues. All of which are of interest to to me as a Canadian and as a member of CRUSH. He said that it should be obvious to any Canadian paying attention that the Harper Government had no respect for Canadian institutions and that they were continually attacking them, using Ideology instead of Intelligence, Fiction instead of Facts, dismissing science, dismissing all expert opinion, and disregarding the opinions of civil servants and was constantly making glaring mistakes because of it. He said that the word 'Accountability' had at it center the smaller word 'count' and that the Harper Government could not count, and that we could not therefore count on them. He said that the Liberal Party of Canada was the party at the very center of Canadian life, but that it was also widely based and very inclusive, and that it was the only party that had any real chance to defeat Harper and form a government, and that a vote for the NDP, or the Greens, was in fact a vote for Stephen Harper. He said that he hoped disillusioned "Progressive" Conservatives who where tired of the lack of progress and the gutting of Canadian institutions and democratic traditions understood that there was a place for them in the Liberal tent. He hoped that New Democrats, who were tired of the current Government's contempt for Parliament and democracy in Canada and their insatiable thirst to gut Canada's much needed social programs will also feel welcome within in the Liberal tent. He said similarly, that those who intended to vote Green, would take heart in the fact that the Liberals are a party that has a deep commitment to the Environment and that again there is room for them under the Liberal banner. He urged all Liberals and would-be liberals to urge all Canadians that it was time to unite the huge majority of us who will not give Harper our support and to unite to defeat him under the Big Red Tent that is the Liberal Party of Canada. 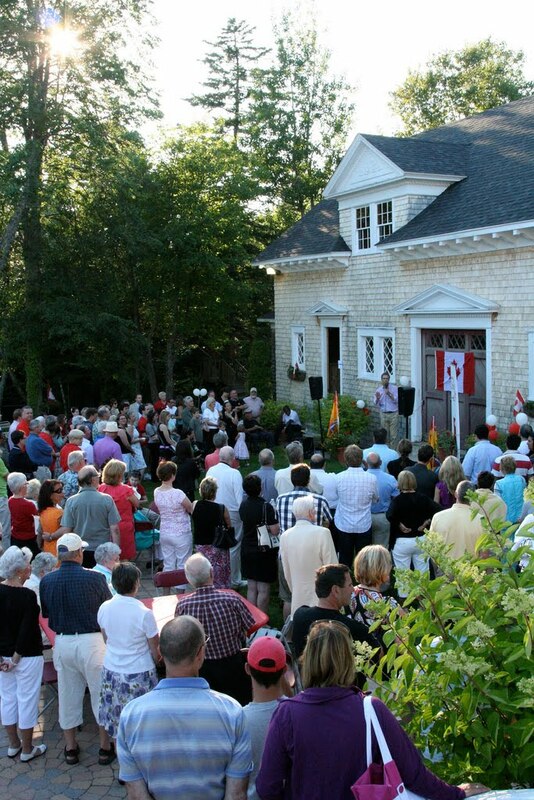 The party, he said "at the very Center of Canadian Life! At this point, Paul Zed joined him briefly and gave him, among other things, a case of 12 Moosehead Beer and said he could enjoy it later to which Michael responded with a quick flick of the tab, a hearty drink, a quick wave and a Cheerful good night to all! I was quite impressed by the speech, finding it satisfying, encouraging, entertaining and inspiring. I found his style deliberate and well focused with a good cadence in spite of the fact that it was not scripted and that it was almost 20 minutes long ("In a gadda deveda" was only a little over seventeen minutes and I suspect, it was scripted, lol) and it sounded very sincere. It was delivered in a strong but friendly tone and was loud enough when required and subtle enough where necessary. That was not the end of the evening, nor in fact, the BBQ. There was still lots to talk about, and plenty of enthusiastic guests to talk to. I was about to take a quick break and grab a smoke, but saw Michael had been asked to give a quick scrum to a handful of local reporters, and with out so much as a second mouthful of MooseHead Beer, walked a few feet onto the lawn and took those questions. I got up quite close but could not hear all of it, but one Question was dealing with Canadian Nuclear Energy and I was able to find a short piece on it in the Telegraph Journal. I of course commented there, and I await the moderator. Feel free to comment on it yourself. Well I am going to call this episode Part Two and push the button soon but before I do, let me just tell ya that in Part Three, I meet Wayne Easter, and get a chance to talk to Judy Sgro about her time as Critic for Veteran's Affairs. And I still want to give you my impression of Zuzanna, with whom I talked, after the speech and before watching the Bus leave for Moncton. I was about 5 minutes behind it, and never saw it at all on my way home. So I guess it must have worked pretty well, eh? It was a great night for driving, and I wasted no time getting home. The Sun is well past risen here in the east as I try to find a way to direct attention to a small meadow in my mind where the river is deep at the shore and to a magical canoe exactly large enough to hold all who dare come aboard. for none are left ashore. a feast of words awaits. a feast for all to taste. the air the same as all. this craft with room for all. Ignatieff samples a MooseHead and waves it to the crowd. Great article. I'm more and more impressed with Mike. Stephen Harper is the worst Prime Minister in Canadian history with no interest in anyone who is not wealthy, corporate or entitled. This leaves most Canadians out in the cold. 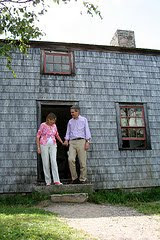 Michael Ignatieff would make a great replacement. That way all Canadians would feel represented and heard. I too, am more and more impressed with Mike. As I hoped, Canadians are not as apathetic as once believed. The tide may be turning, and now is the time for Michael to drive home the winning message, that Canadians are not ideologes. 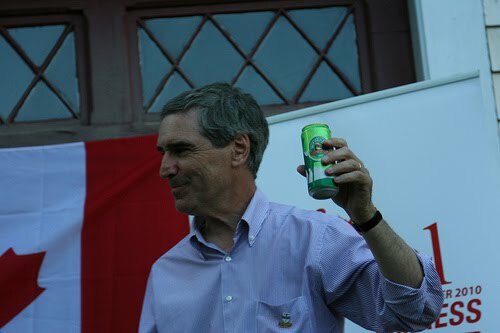 We know who we are, are comfortable with it and if Mr Ignatieff can run with that,he can win this. Kim, This is very hopeful and I wish I was there. I'll have to watch for him in the west. I love your poem too. I'll put a link on my blog to this one. Good work! Nice to hear from all of you! 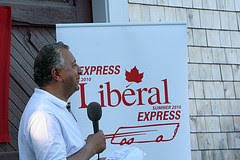 Gary, if you are interested, you can get more info at http://www.liberal.ca/ Hope you get to see them, and remeber, they are not shy. They will talk to yuou and answer your questions, Just like Stephen Harper would do, eh? lol! Thanks for this very interesting account Kim. It does give a good sense of the real Michael Ignatieff to counteract all of the despicable, negative spin that Harper puts out about him. We need to hear more of these stories! Nice Blog. Good to hear that there are Politicians that remember the East and feel connected here. But really people come from all over the world to visit Eastern Canada and feel connected and at Home here. (as I have also felt when visiting out West, just maybe that Down Home feeling is more prominent here). Sounds like a good time was had by all. Thanks for sharing. Well, well, a *very* fun account, and read. Yes, I too, in reading, wished I could've been there as well! Hope Kim visits more of these!